Well, maybe I should start by stating the truth: no college will ever be the PERFECT college, but perhaps you can find one that’s pretty darn close! April is prime everybody-post-where-you’re-going-to-college time. At this point, it seems like all of your friends know exactly where they’re headed and if you are left staring at your drawer full of college information and acceptance letters, you’re not alone. Take a deep breath, give yourself some grace (this is a big decision, it’s OK not to know right away), and take it one day at a time. Give these 8 steps a try! Decide what is important to you and prioritize. Think about the academics, the people, the atmosphere, the night life, the organizations, the opportunities, the location, and the price. Put the aspects of college that matter the most at the top of your list and the stuff that you are flexible on at the bottom. 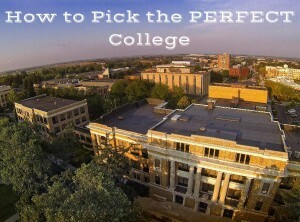 Pick your top three, or your top five, or your top ten; Wherever you’re at in the college search! Take your top colleges and compare them to each other and to your wish list. It never hurts. Here at BG, we SUGGEST that you shoot for a 20 ACT (900 SAT) and a 2.5 GPA but if one is higher or lower, they can always balance each other out. So go for it! You never know unless you try. Sometimes you have to give the school a real chance. Reading about the university on paper is WAY different than walking around on campus and soaking in the atmosphere/environment. I know sometimes the trips seem daunting and just plain inconvenient, but look at them as a way to spend some quality time with your parental units before their little baby flees the nest. Can you tell I like lists?! After visiting your top schools, record what stuck out to you and what you could live without. If you don’t, it can be quite easy to forget how you felt after each visit! They can all start to run together quite quickly. Once you’ve narrowed your list down to just a few schools, take your pros and cons lists and your wish list and decide which schools match up the best. Filter out the ones that have too many cons or don’t line up to your wish list. Seriously. Be your own therapist and ask yourself how you felt at each school. Could you see yourself going there? Honestly, in the end, it’ll all work out. Just like there are no perfect schools, there are no horrible schools, either! That’s the good news! But I also understand how that does you NO good at all. But perhaps it’ll give you some peace in knowing that you can be happy wherever you go.